Discussion in 'Intermediate CJ-5 and CJ-6 Tech' started by Shootinok, Oct 29, 2018. I won this jeep on an auction and introduced myself here on my first full day of ownership. It is registered as a 1969. I have no way to know the history of this thing but am learning so much being on here (thank you all) I've learned it is definitely not a '69. Seems unscrupulous for someone to change a vin tag - but here I am with one. Not unhappy at all with my purchase as I still think I got a good project starting point. Pan appears to be in good shape. shifter has an awesome mod. 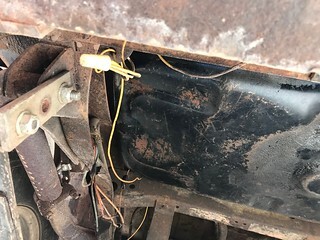 Fuel filler hole is filled in and screwed in with sheet metal screws. There is a fuel tank in the back that appears to go through the floor and the fuel filler is behind the spare tire. 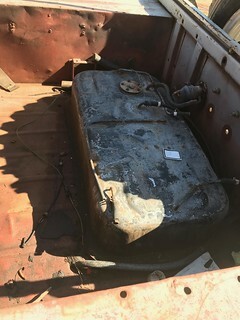 Get the fuel tank etc figured out - could go with a rear tank under the bed and between the frame rails (standard 15 gal for intermediate and later cjs) - or could go with an under seat 10 gal tank like an early. Underseat set-up might be easier to instal, but the rear 15 gal should be okay on the intermediate frame. Then get it running and driving...and stopping. The hanging pedals, D30 front with 11 inch drums, saginaw steering, quiet D20 with flanged centered D44 are all good pieces. 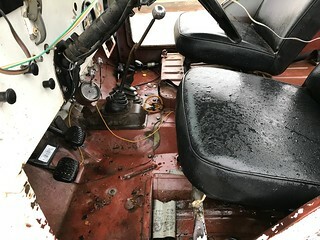 Early tub since it had filler by drivers door, and provisions to locate tank under the seat. 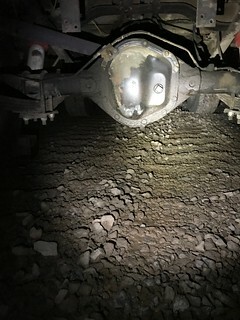 Intermediate winsdhield and front clip. Intermediate chassis, engine, driveline. Nothing unscrupulous about it, so far as I'm concerned. Unless someone plays games with titles for purpose of covering up a theft or defrauding a buyer then there is no victim. If the Jeep's legit, you must aquit. 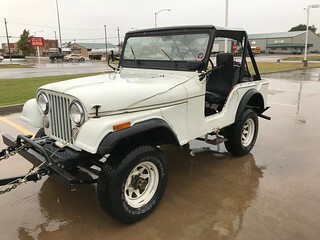 Early tub....that would indeed explain why it has a 69' title for what is otherwise an intermediate year cj5. In some places people do that sort of thing to circumvent emissions laws (although around here the intermediate years are still exempt). If the numbers match the title and the DMV official rubber stamps it, you're good. Looks most like an intermediate. The inline 6 is 1972 or newer. About the only thing I see like a '69 is the windshield. It's the bottom mounted wiper type with the motor on the outside and the earlier rectangular glass. Dash could be a '69 but I'd say '72 if I hadn't read the above. A hole for an under-seat tank suggests an earlier tub, but the under-seat tank was a common owner-mod in that era. If the tank was there originally, there would be a filler neck recess welded in to the body. A plate screwed in sounds like an owner modification. Solid back panel is either a '71 or newer Renegade model, or a '73 or newer (available optionally starting in 1973). More and larger pictures would help. 640x480 or 800x600 are good sizes for pictures. Is there a VIN tag? Title swaps are not legal, but show up occasionally. There is a Kaiser vin tag but its screwed on with 4 Philips screws. pics I see of them are riveted. Tells me it was swapped. There is no tail gate. Casting number on the block indicates it's a 232. Nothing wrong with the 232. 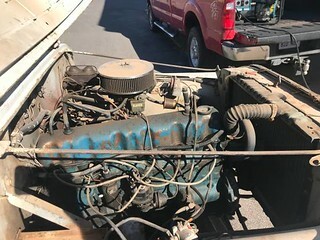 It was the standard engine '72-78(?) ... likely a Borg-Warner T-14 transmission and a Dana 20 transfer case. There is a 1974 TSM here Jeep® Parts Manuals online that you may find useful. There should be a build date stamped into a little platform on the side of the block. That may tell you something. "A" is a 1V 258, and "E" is a 232. This says Sept 18, 1976 (03 == 1976). There is a Kaiser vin tag but its screwed on with 4 Philips screws. That is pretty normal for many jeeps. Thanks so much timgr !! Soo... according to the AMC engine build code I found online, mine must be a 258 built on September 27, 1971 - making it probably a 1972 model. That would match with the dash. Looked back your intro thread pic. The Jeep lettering on the passenger side of the tub looks amc intermediate to me. I bet someone just switched the vin tag on that. I don't see a single part that wouldn't have come on a 72 so go with it. The intermediates were probably the best universal Jeep ever made. Love my intermediate. If registration isn’t an issue leave it titled as is.